In Manhattan just as in towns all over the United States, the warmer weather usually means a lot more street fairs, flea markets, and festivals. From April through October, several of Manhattan's streets transform into open-air fairs, as they are closed to vehicular traffic and opened to throngs of fair fans who come to chow down, browse wares, and soak up the sun. While you are almost certain to stumble upon one during the course of any busy summer weekend, do not leave your outing to happenstance. Especially if you are an out-of-town visitor, there is usually nothing more authentic than souvenirs purchased from these local vendors who reflect the character of New York City more than a mug or keychain ever could. Food is often the way to a person's heart. Arrive hungrily and you will find plenty of lemonade stands, souvlaki vendors, crepe stands, and more to whet your appetite. One of the biggest food festivals is the 9th Avenue International Food Festival in May, which spans 9th Avenue from 42nd Street to 57th Street. Next, get ready to browse the numerous canopied tables and stands that are lined with everything from CDs to clothing, as well as more unexpected finds, like estate jewelry, antiques, or works of art. Some street fairs also feature live musical entertainment, dancing demonstrations, rides, face painting and other activities for children to enjoy while mom and dad peruse the wares for sale. Dozens of Manhattan street fairs occur each month during the warmer months. Some street fairs can feel cookie-cutter, but others have more of a cultural flair like the Japan Block Fair in October or the Bastille Day Festival in July. Learn more about what you can discover in June through October when most of these street fairs are in action. June: More than 20 street fairs are scheduled for June—look for some of the biggies like the Turtle Bay Festival, the Avenue of The Americas Expo, and the Murray Hill Neighborhood Festival. July: Check out some two dozen fun street festivals in July, including the popular Bastille Day Festival. August: Choose from more than a dozen street fairs unfolding across the city, with larger ones to look out for like the Eighth Avenue Festival or the Lexington Avenue Summerfest. 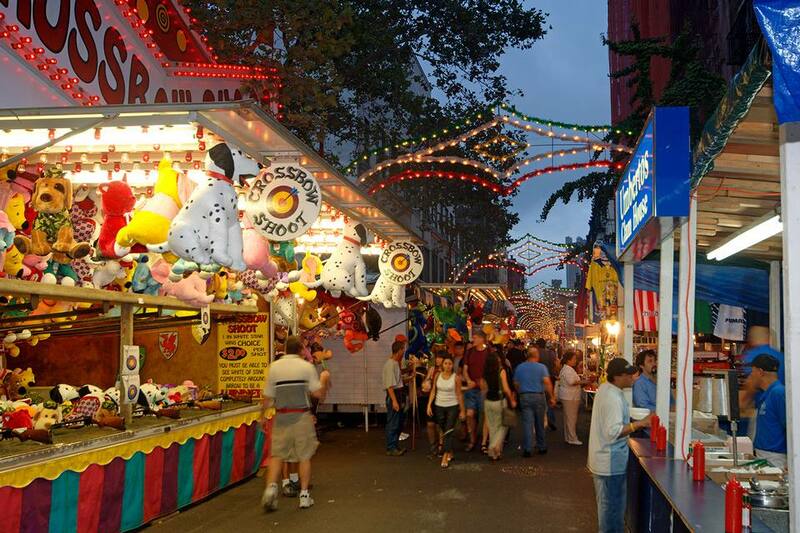 September: September is a great time, with pleasantly cooled-down temps, to indulge in your favorite fair fare, like the famous San Gennaro festival. October: Enjoy fall's crisp days with some 25 fall street fairs scheduled, with some unique highlights like the Japan Block Fair. Most street fairs run between 10 a.m. and 6 p.m., though for a safer bet, arrive between 11 a.m. and 4 p.m. to ensure the vendors are all still there and that the fair is in full swing. Go earlier in the day, before noon, ahead of the crowds—and you can get the best dibs on shopping, and the freshest fare from the food stands.